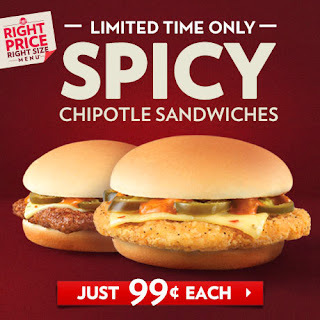 Wendy's latest value-menu entries, the Spicy Chipotle Cheeseburger and Spicy Chipotle Chicken Sandwich feature a beef patty or crispy chicken patty along with a simple combination of pepper jack cheese, chipotle sauce, and jalapenos on a plain junior hamburger bun for 99 cents a piece. The Monterey Melt is back at Whataburger and this time around it comes in as a permanent menu addition. 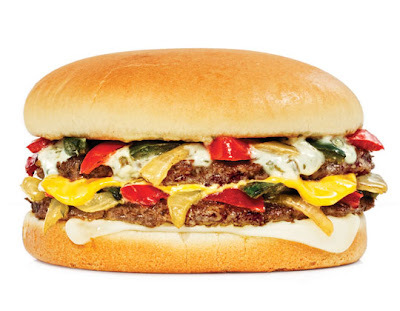 It features two beef patties, American and Monterey Jack Cheese slices, grilled peppers and onions, plus jalapeno ranch sauce. 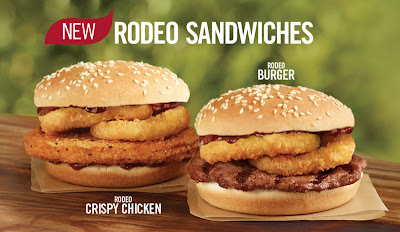 Burger King is out with new, limited-time $1 Rodeo Sandwiches and with the latest addition, have renamed their BK Value Menu to the "King Deals Value Menu." 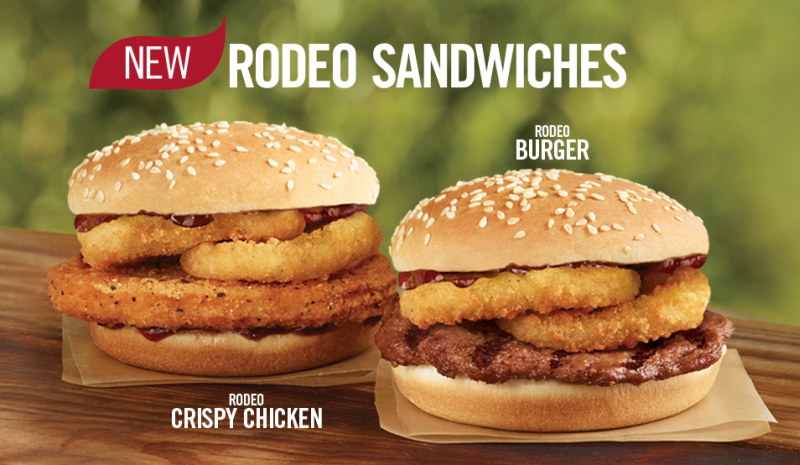 The new Rodeo Sandwiches consist of the Rodeo Crispy Chicken and the Rodeo Burger. Both are slight variations on the Rodeo Cheeseburger that Burger King used to offer. Papa John's Chipotle Chicken & Bacon Pizza features creamy chipotle sauce, sliced Chicken Poppers, smoky bacon, diced Roma tomatoes, and grated cheddar cheese in addition to the standard mozzarella. 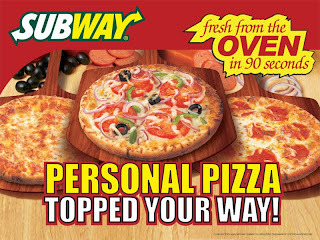 It's promoted at $11 for a large pizza but I picked one up for $8.99 during the Early Week Special. 2013 saw the introduction of a lot of new fast food menu items probably more so than previous years due to the landscape becoming increasingly competitive. Popeyes has brought back their Wicked Chicken with an added twist by marinating them in a "Lousiana-style buffalo marinade," tossing them in Buffalo sauce and calling them Bayou Buffalo Wicked Chicken. Jack in the Box is looking into "better-for-you" options with the addition of the new Egg White & Turkey Sandwich. They've also added new, criss-cut Sweet Potato Fries for a limited time. The Egg White & Turkey Sandwich features a grilled slice of turkey, tomato, American cheese, and egg whites on a plain burger bun. Sweet Potato Popchips are air-popped sweet potato chips. They still use oil to cook them but less so than the more typical deep-frying. I bought a 3-ounce bag for $2.69. 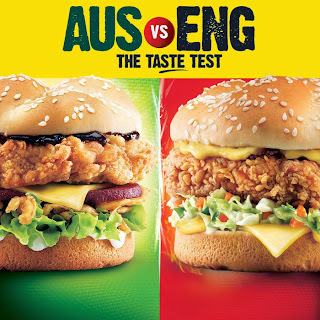 In honor of the Ashes cricket series currently underway between Australia and England, KFC Australia, an official sponsor of Australian Cricket, offers up two themed chicken sandwiches; one for each country. The Aussie Burger features an Original Recipe chicken breast, a slice of beet, crispy onion, cheese, and lettuce with tangy BBQ sauce on a sesame seed bun. Kashi recently launched new single-serve pizzas in two international flavors: Greek Tzatziki and Tikka Masala. Kashi's Greek Tzatziki Single-Serve Pizza features a stone-fire crust that like seemingly everything else by Kashi contains their signature Seven Whole Grains plus flax and sesame. The pizza is topped with spinach, artichokes, tomatoes, feta cheese, mozzarella, and a sauce of Greek tzatiki (yogurt sauce), cucumber, dill, and garlic. Cinnamon & Sugar Pringles are a limited-time flavor for this fall-winter. Just like they sound, they're Pringles potato chips dusted with cinnamon and sugar. A 5.96-ounce canister was $1.50. Around the World: Where can you get Chili from McDonald's? While a bowl/cup full of chili has long been the domain of Wendy's, it's not something you'd find at McDonald's or most fast food chains for that matter... except in Austria where, earlier this year, McDonald's began offering Chili Con Carne. 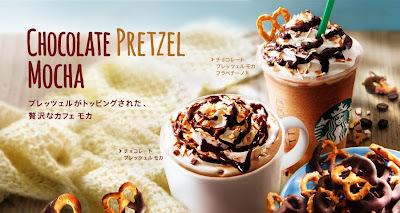 Christmas just ended but over in Japan, Starbucks has already unveiled their Valentine's Day beverages with the new, limited-time Chocolate Pretzel Mochas and Frappuccinos set to arrive on January 15, 2014. Banquet's Pepperoni Pizza Meal consists of a reduced-fat pepperoni pizza and chocolate pudding. A 5.75-ounce box was $1. Wienerschnitzel is offering 99-cent corn dogs through January 31, 2014 at participating location. The corn dogs are made with chicken franks and are typically priced in the $1 to $1.50 range (varying with location). 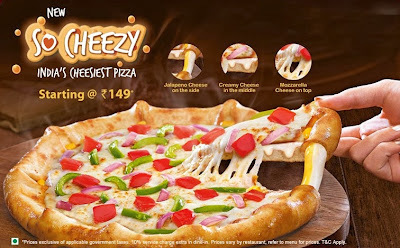 Pizza Hut India's latest pizza, the "So Cheezy Pizza," features a combination that may be more cheese than crust. 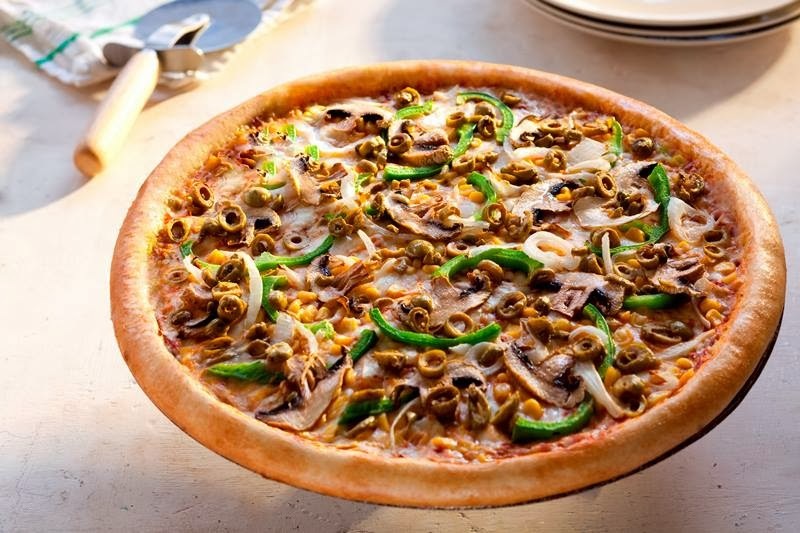 Besides having mozzarella cheese on top and jalapeno cheese stuffed into the end crust, the pizza also has "creamy cheese" instead of the typical tomato-based pizza sauce (the sauce appears to be a cream-cheese-based sauce). Earl of Sandwich's Holiday Turkey Sandwich features sliced turkey, stuffing, gravy, and cranberry sauce on fresh-baked bread. I got one for $6.99. Hershey's Candy Cane White Chocolate Bar is a mint-flavored white chocolate version of their classic chocolate bar with bits of candy in it. I picked a 3.5-ounce bar up for $1.59. Holiday Mint M&M's are basically a milk chocolate version of Dark Chocolate Mint M&M's. Being the holidays, they come in red, green, and white rather than many shades of green. I picked up a 9.90-ounce bag for $1.98 on sale. Over in the UK, a full-on holiday menu (not just dessert) is a regular thing for McDonald's. They call it the Festive Menu and it usually features a couple of sandwiches, a side, and a few desserts. Grill 'Em All's Molly Hatchet Burger is only available on Mondays ("Molly Hatchet Mondays") and features a half-pound, medium-rare burger with seared fennel sausage gravy, maple syrup, and bacon. Like a lot of their burgers, it carries a heavy metal reference. I paid $9 for one. While Krispy Kreme's holiday donuts in the US are mostly decoration, over in the UK, they take on more traditional Christmas desserts with the new Mince Pie Donut and Festive Truffle Donut. Grandma's brand's Red Velvet Cookie is a soft-baked red velvet flavored cookie frosted with sweet white icing. I picked one up for 79 cents. Like Denny's here in the US, Burger King Malaysia is running a cross-promotion with the latest The Hobbit movie, The Desolation of Smaug. Instead of the Fire Burger that Denny's is offering, Burger King is going with the Angry Dragon Beef and Angry Dragon Chicken. The Angry Dragon in question being Smaug. KFC restaurants in the Middle East (Arabia) recently introduced new Poppers to the menu. Each Popper features a cheese-stuffed spicy jalapeno. While they're available a la carte in 3-piece orders, they can also be had inside of two sandwiches: the Chicken Poppers sandwich and the KFC Royal Poppers sandwich. Gingerbread M&M's are a limited-time flavor for this holiday season featuring over-sized milk chocolate M&M's candies with some gingerbread flavor thrown in. A 9.90-ounce bag was $2.88. 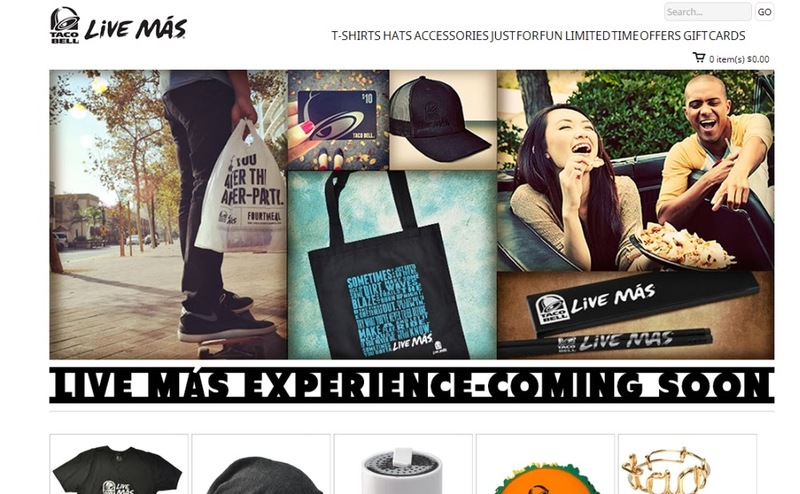 Playing along the lines of their latest slogan, "Live Mas," Taco Bell recently launched the Live Mas online store selling Live Mas branded apparel and accessories. 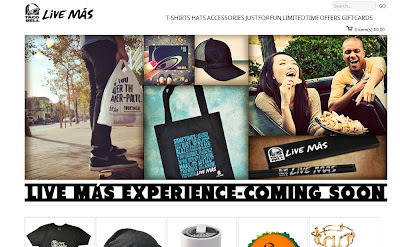 Beyond the standard T-shirts and caps, Taco Bell's Live Mas store seems more like a lifestyle brand for the Taco Bell super fan than anything. Wendy's Japan is offering the "Wendy's Snowcrab Special' as a new, limited-time winter addition to their "Japan Premium" line of high-end burgers. 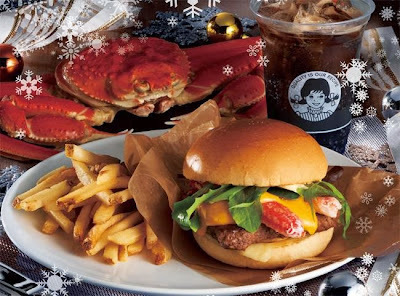 The burger's main feature is layers of snow crab in a bisque sauce made with a broth from crab and shrimp shells. Along for the ride are a spring mix, beef patty, cheese sauce, and a bun. Ben & Jerry's Pumpkin Cheesecake Ice Cream is a limited-time flavor featuring pumpkin cheesecake ice cream with a graham cracker swirl. It's a fall flavor (that took me a while to locate) but apparently still available in store while supplies last. I bought a pint for $3.88. 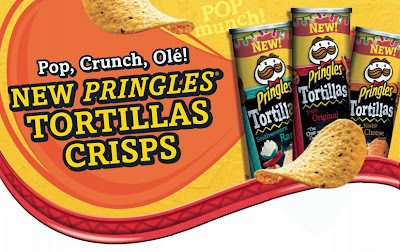 Pringles is branching out into corn tortilla chips with the introduction of new Pringles Tortilla Crisps. The chips are currently available at Walmart and will be available at retailers nationwide in January. The new tortilla chips come in three flavors: Truly Original, Nacho Cheese, and Southwestern Ranch (Walmart also carries Zesty Salsa as an exclusive flavor). Domino's is looking to try their hand at (super) high-end pizza by offering the new, limited-time $50 Wagyu Duet in Australia. comes topped with premium wagyu beef. Purporting to offer "restaurant-quality" ingredients, the Wagyu Duet is actually two pizzas: the Wagyu 3 Ways and Wagyu & Truffle Hollandaise. 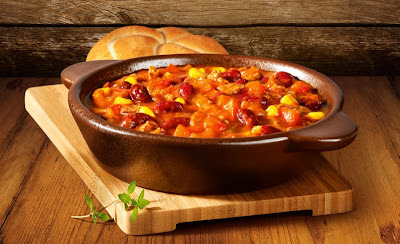 Chick-fil-A's Chicken Tortilla Soup features shredded boneless chicken breast, navy and black beans, a blend of vegetables (including onions, corn, bell peppers, celery), a variety of spices in a cream-based soup, topped with seasoned tortilla strips. It's $3.99 for a good-sized cup but I received this courtesy of Chick-fil-A. Wendy's is poised to add some value-priced spice this winter with the upcoming release of the new, limited-time Spicy Chipotle Jr. Cheeseburger and Spicy Chipotle Crispy Chicken Sandwich. Priced at 99 cents a piece, the sandwiches feature a choice of either a beef patty or crispy chicken patty along with pepper jack cheese, sliced jalapenos, and a spicy chipotle sauce made with a mix of ancho and chipotle chillies. Although some locations have already started to offering them, the official launch of the Spicy Chipotle sandwiches isn't until next week. 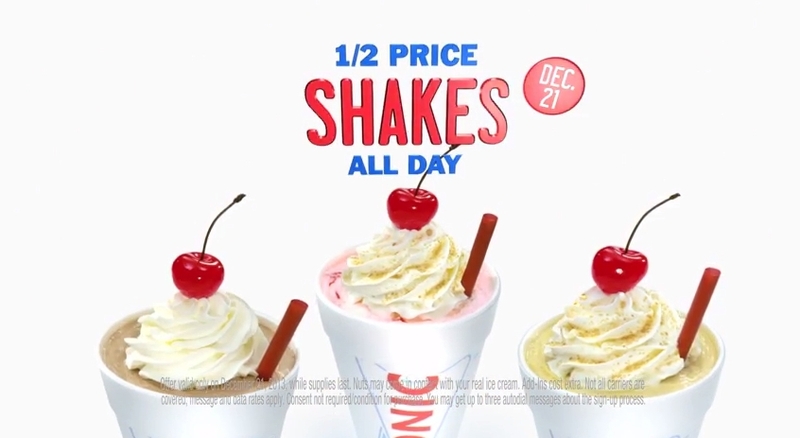 Sonic is continuing their annual tradition of offering half-price shakes all day on the Winter Solstice (i.e. the longest night of the year), which falls on December 21 this year (this upcoming Saturday). Beyond their regular and fairly expansive shake menu, Sonic is currently offering Holiday Mint Shakes in chocolate or vanilla flavor. Sonic's Holiday Mint Shake features vanilla ice cream shake blended with crushed holiday mints and finished with whipped topping, more crushed mints, and a maraschino cherry. It's also available with chocolate ice cream. A Mini-sized cup goes for $2.29 but I received this one courtesy of Sonic. 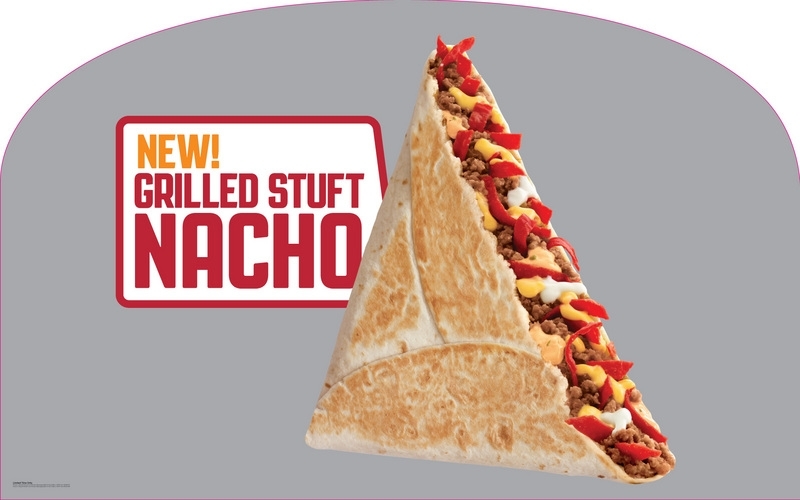 Taco Bell will be serving up new, limited-time Grilled Stuft Nacho starting tomorrow, Thursday, December 19th. 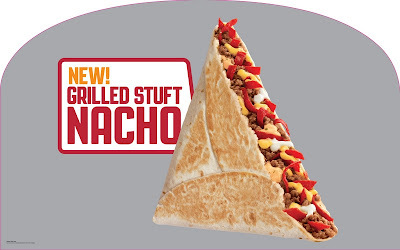 Designed as a more portable version of classic nachos, the Grilled Stuft Nacho comes in a grilled flour tortilla that is folded to resemble a triangular giant tortilla chip. Inside the tortilla is a filling of seasoned beef, new zesty nacho sauce, reduced-fat sour cream, warm nacho cheese sauce, and red tortilla strips for crunch. 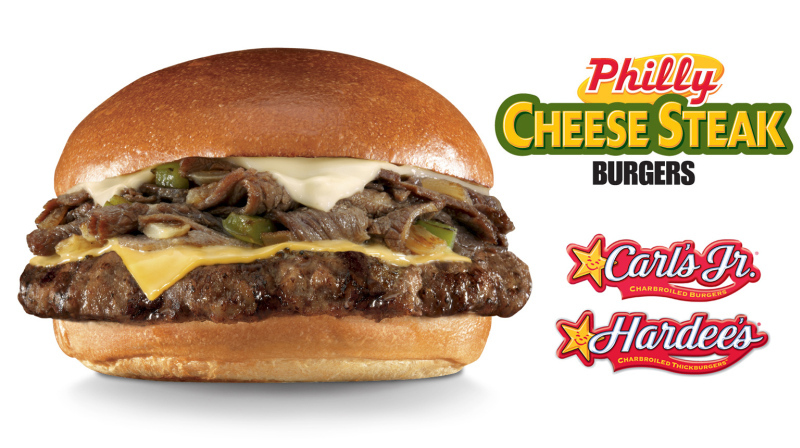 The Philly Cheesesteak Burger is back at Carl's Jr. and Hardee's restaurants. It comes with thinly-sliced steak, grilled onions, green peppers, Swiss and American cheeses, mayo, and a beef patty (single, double, or Six Dollar / 1/3 lb.). The Six Dollar / 1/3 lb. version comes on the chains' new fresh-baked buns (an available upgrade on the single and double). Sonic has brought back quarter pound Footlong versions of each variety of their hot dogs for a limited time and are pairing them with an order of tots and charging $3.99 for the combo. 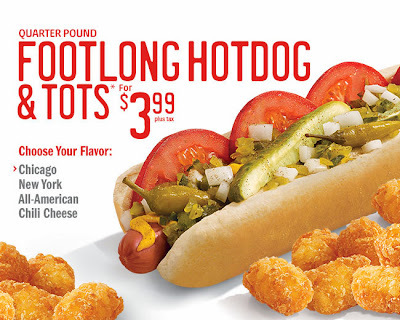 The hot dogs are available in four varieties: Chicago, New York, All-American, and Chili Cheese Coney. Starbucks Frosted Snowman Cookie is a holiday offering and features a hand-decorated shortbread cookie shaped like a snowman and frosted with white icing and a milk chocolate hat. I paid $2.25 for one. Subway plans to open a new pizza concept called Subway Pizza Express next semester at the University of Nebraska-Lincoln according to the university's student newspaper, The Daily Nebraskan. The concept eschews Subway's signature sub sandwiches for made-to-order personal pizzas with choose-your-own-toppings (basically the same pizzas currently offered at select Subway stores). After six months of work, Domino's has developed their first vegan pizza ever and just started offering it in Israel this week. 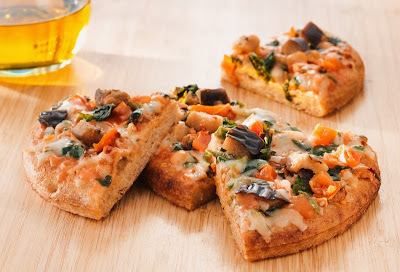 The new pizza is topped with a non-dairy soy-based "cheese" and vegetables such as olives, tomatoes, spinach, and eggplant. Jack in the Box's new Fajita Ranch Melt is only available for a limited time in California, Idaho, Hawaii, Nevada and Utah. It features grilled chicken, grilled onions, fire roasted red and green bell peppers, pepper jack cheese, ranch sauce, and taco sauce on grilled sourdough bread. I picked one up for $3.99. 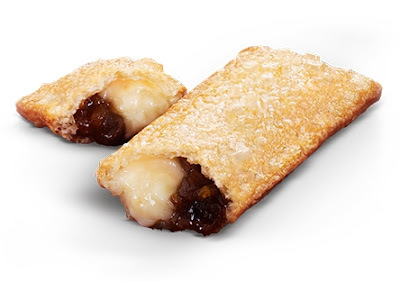 While we here in the States once again get the Holiday Pie for this Christmas season, McDonald's Canada gets a chocolate mint pie based on After Eight thin mints. Chick-fil-A opened a Hawaiian-themed restaurant last week in La Fayetteville, Georgia. 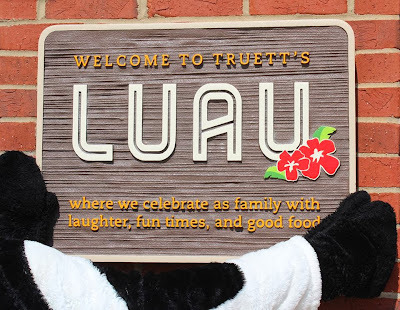 Going by the name "Truett's Luau," (named after the chain's founder Truett S. Cathy), it joins a number of Chick-fil-A concept restaurants including a diner concept (Truett's Grill), a full-service restaurant concept (Dwarf House), and a pizza concept (Truett's Pizza Cafe). Jack in the Box has replaced their old buttermilk biscuits with new "Southern Style Biscuits," which are also buttermilk biscuits... (hopefully they're more buttery). 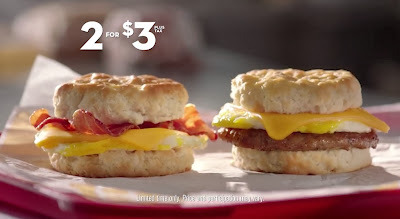 To promote the new biscuits, Jack is offering a limited-time two Biscuit Sandwiches for $3 deal. Trader Joe's Pumpkin Bread Pudding is a seasonal fall offering that's been sitting in my fridge since November that features a mix of pumpkin bread and pumpkin custard baked together. A 20-ounce box was $3.99. Domino's Singapore recently unveiled new Cheesy Crust as a crust option on their pizzas. The concept isn't new or groundbreaking but there are a few small tweaks that makes it sound a lot better than your typical stuffed crust pizza (especially considering that Domino's doesn't even offer stuffed crust here in the US). McDonald's Switzerland is in the midst of an annual Swiss Weeks line of limited-time burgers featuring local tastes and ingredients. And just what does Swiss ingredients mean? Swiss beef and Swiss cheeses (but not Swiss cheese as we know it). Hot Cocoa with Marshmallow Three Musketeers Minis are here for the holidays and are touted as "whipped up, fluffy chocolate-on-hot-cocoa taste." A 10-ounce bag was $2.99 on sale. McDonald's France is currently running a limited-time American-themed promotion called "Breads & America" featuring burgers with various "American" buns.